It’s an uncomplicated, no-brainer, and although Ms. Baker was referring specifically to the State Assembly of Georgia, her concerns about the integrity of government are echoed across this nation, everyday. Lobbyists are stealing our representatives from us. They steal the lawmakers’ time from us, steal their attention from us and stake claim to their political will. We have come to expect those we elect to pay more attention to the lobbyists who take them to Europe and pay their greens fees at posh golf resorts, than they do helping us stay in our homes, put food on our tables, have reliable inter-city transportation, and insure our kids get a valued and affordable education. 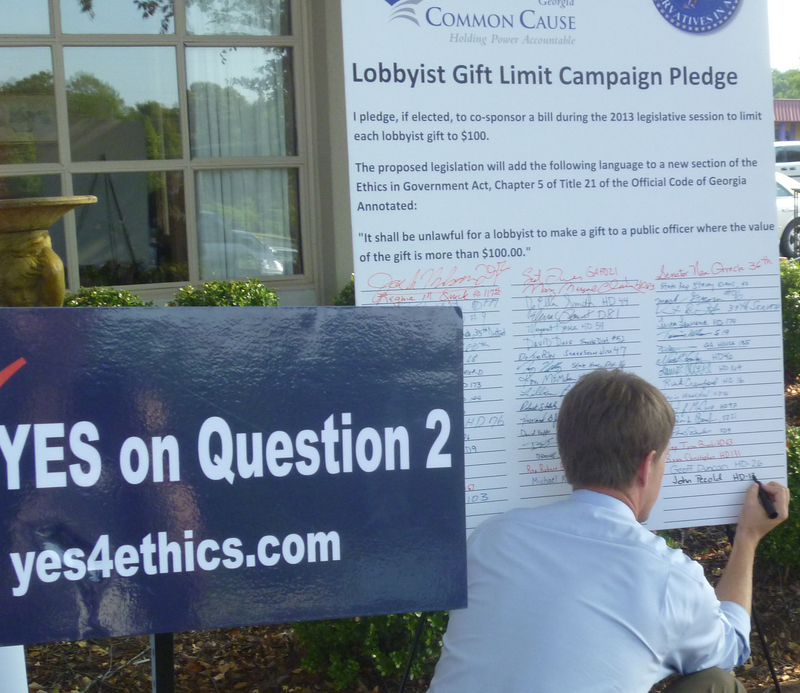 Pezold signed the Lobbyist Gift Limit Campaign Pledge, Wednesday, during the Ethics Express bus tour around Georgia. The pledge, signed by over 130 other incumbent and challenging candidates for seats in the Georgia Legislature this year, is a way to let Peach State voters know that if any of the signers are elected, or reelected, in November, they promise to push for lobbyist limitations of $100 dollars a day in the 2013 legislative session. It has been signed by progressive Democrats, like Atlanta’s Nan Orrock and Vincent Fort, as well as by conservative Republicans, like Waycross’ Mark Hatfield and Macon’s Cecil Staton. The 4-day Ethics Express bus tour was conceived to bring attention to a non-binding question on both parties’ ballots for the primary election on July 31, urging the state legislature to approve such a measure. 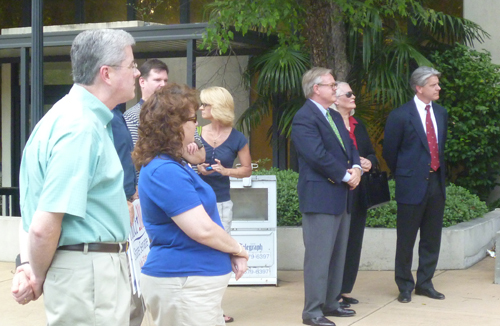 State Sen. Cecil Staton (green shirt), and his primary challenger Spencer Price (back, with red tie) in Macon, July 25, listening to speakers on the Ethics Express tour. Earlier in the day, at a stop in Macon, two signers of the campaign pledge, the incumbent Staton and his rival in next Tuesday’s Republican primary, Spencer Price, both stood with the Ethics Express participants on a hot sidewalk outside the Bibb County Courthouse, to show their support for the lobbying cap.